The Loft Office Building was originally designed in 1896 by architect Gottfried L. Norrman for Wellhouse and Sons, a manufacturer and wholesaler of stationery, paper bags, and boxes. This building is an excellent example of the plain commercial architectural style of the 1890’s. It is one of the few surviving warehouse structures from this period in Atlanta, and the only remaining manufacturing facility attributable to Gottfried L. Norrman. Additionally, it demonstrates the potential for attractive reuse, and the subsequent upgrading effect such reuse imposes on surrounding property. In 1869, Meyer Wellhouse and his family had arrived in Atlanta and joined other newcomers and longtime residents in developing Atlanta into a major city. The Wellhouses and their children were one of the first of many Jewish families to come to Atlanta after the Civil War. Over the next few decades, Wellhouse and his sons established a thriving business in wholesaling and manufacturing of paper bags and boxes. Gottfried Norrman had established an important relationship with Atlanta’s Jewish community, and had designed homes for several Jewish leaders including Henry Wellhouse (Meyer Wellhouse’s oldest son), as well as a $40,000 store on Whitehall Street for Joseph Hirsch. Therefore, it was not surprising when, in 1896, the sons of Meyer Wellhouse contracted with Gottfried Norrman to design a factory and warehouse facility for their paper and box manufacturing company. The building that Norrman designed for Meyer Wellhouse’s sons was located on Decatur Street, and served as headquarters for their company from its construction in 1896 until 1912, when space limitations forced a move to a larger facility. The building remained vacant or was rented by the Cotton States Belting Company until 1920 when it was purchased by Louis Aronstam for his new building supply business. For the next 79 years (1920 – 1999), this building served as the headquarters of Southern GF (General Fireproofing) Company. It has been closely associated with Atlanta’s Jewish community throughout its history, having been built, owned, and operated by several of the Jewish community’s leading citizens. Within walking distance of the central business district, the building was and has remained a significant part of Atlanta’s business community throughout its existence. This building is a remarkable reminder of the explosive growth of Decatur Street during the 1890s and of the importance of the railroad in the development of the city as a commercial and industrial center. It is closely associated with prominent individuals and urban trends of great significance to the city. For over 100 years, it has maintained its architectural integrity and has been utilized for purposes similar to those for which it was originally built (i.e., commercial and industrial facilities and headquarters for locally owned businesses of regional importance). It is one of the few remaining manufacturing structures from the nineteenth century in Atlanta. Gottfried L. Norrman, who became one of Atlanta’s first and foremost architects, arrived in Atlanta in 1881 to help design the buildings for the Cotton States Exposition. Originally from Sweden, he lived briefly in South Carolina, but was attracted to Atlanta, along with many other professional men during the 1880s. During this decade he designed Fountain Hall at Atlanta University, the Edward Peters residence (formerly the Mansion Restaurant), and the Gate City Bank building (the original Equitable building). He was also the architect for the buildings of the Piedmont Exposition in October of 1887 in the newly created Piedmont Park. Norrman moved in the highest circles of Atlanta society, being one of the first members of the Capitol City Club, and a guest at important functions like the reception for President Grover Cleveland’s visit in October, 1887. During the last two decades of his life, Norrman designed many important commercial buildings in Atlanta and throughout the South, as well as numerous private homes in Inman Park, Midtown, and on Peachtree, West Peachtree, and Spring Streets. He was a fellow of the American Institute of Architects, and was the founder of the Southern Chapter of this organization in 1892 and the Atlanta Chapter in 1906. In the final year of his life, Norrman designed one of the first homes in Ansley Park and the first new home in Druid Hills for Judge John S. Candler. Shortly before his death in 1909, he joined with young architects Hal F. Hentz and J. Neel Reid to establish the firm of Norrman, Hentz & Reid. After Norrman’s death in November of 1909, the firm’s name was changed to Hentz & Reid, and with the addition of Philip Shutze in the 1920’s, became possibly Atlanta’s most important architectural firm of the twentieth century. The historic role of Decatur Street and the importance of this structure, which has survived as a rare example of Norrman’s work, make this building an extremely significant part of Atlanta’s history and deserving of landmark status. During the last decades of the nineteenth century, Atlanta was emerging and rebuilding from the devastation and almost total destruction of the Civil War and the economic depression of the 1870s. Important work had been done to rebuild the railroad on which Atlanta’s growth had and would continue to be based, and industrial production was beginning to thrive. In the mid-1880s, the area of Decatur Street between what is now the interstate highway and Bell Street contained many large single family residences on large lots, but the railroad had already attracted warehouses and manufacturers to the area. Many of the large dwelling houses became combination homes and stores, and additional buildings devoted solely to commerce were added. Just beyond Oakland Cemetery, the massive Fulton Bag and Cotton Mill in what is now called Cabbagetown was established. 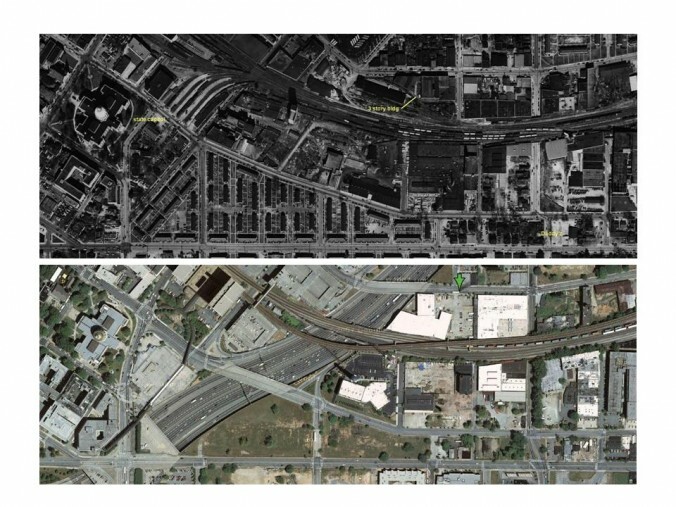 By 1892, Decatur Street was almost completely commercial, and large factories, depots, warehouses, and stockyards began to appear in the area along the rail line. From 1912 to 1919, the building at 263 Decatur Street was either vacant or occupied by the Cotton States Belting and Supply Company. In 1920, Louis Aronstam purchased the property for his building supply business. Aronstam was from New York City and had attended the United States Naval Academy, eventually getting a degree in engineering. On a business trip to Sumter, South Carolina, he met Rita Schwartz, who was a student at Agnes Scott College in Decatur. On a subsequent trip to visit her in Atlanta, he was hired by the General Fireproofing Corporation to represent them in the South. After several years as a salesman for that company, he partially adopted their name, creating the Southern GF Company. The business prospered and expanded over the years as the city grew. Mr. Aronstam served as president of Southern GF Company until his death in 1969. After Aronstam’s death, his son-in-law, Herbert Cohen, who came to work for Southern GF Company in 1947, took over as president and chairman. Mr. Cohen kept operations of the business primarily at 263 Decatur Street in the original Wellhouse and Sons building. In 1974, he contracted with architect Ted Close to renovate and restore the building, adding the alcoves and iron gates on the front of the building and painting the exterior brick. Mr. Cohen remained as president and chairman until his retirement in the early 1990s. He was succeeded by his son-in-law, Peter Emmons, who is the current president of the Southern GF Company. In 1999, the Southern GF Company moved its headquarters to northwest Atlanta, and the building, which is now located in the Atlanta Empowerment Zone, was sold to Johnson Real Estate Investments. In 2007, the building was fully restored to its original condition and was converted to a loft office building.